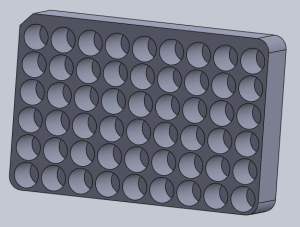 Recently, we brought two CTC PAL systems on-line in the group and in an effort to save a little bit of money* and explore the utility of 3D printing we engaged the engineering department at WSU to print out a sample trays that was compatible with the PAL system. Granted the result doesn’t have the fancy vial numbers (nor did we try) but the result was quite pleasing. 3D printing still isn’t dirt cheap when you factor in the time but at least for this application the trays were a significant break compared to the commercial version. *sure the cost of the PAL vastly exceeds the cost of single tray but every little bit counts at this stage.